Property # 118047 The garden cottage also with same things and on the river. Only 12 minutes from downtown Helen. We have more to do than any other rental in this area. UNLIKE MOST RIVER homes in this area::: NO STEEP STEPS or driveway to river, so you can actually enjoy your stay and use the river!! Read their sites carefully or ask as sometimes they do not tell you about this. The N Georgia Mountains like it used to be. This cottage is in the woods, quiet area & lots of wildlife. Deer, turkey, beaver, etc. Our places are the CLEANEST you will find anywhere. We have 6 tubes, 4 kayaks, a slide in your backyard, swing next to the riverand horse shoe pit in your back yard and a rope swing for your use that is a short walk from cottage. We keep up with our equipment some homes do not. We pride ourselves in having almost 40% repeat renters. Very Quiet area of the river so you have the place pretty much to yourselves!! We have tubes available from May to end of September, unless weather or water temp permits it sooner or later. Kayaks are out from March till end of October, unless weather and water temp permit. Only vacation rental cabin in Helen Georgia / N. G.a mountains w/ FARMHOUSE STYLE homes. Will be glad to make any arrangements you'll need to make your stay perfect, just ask! Unlike other homes we are right here to help you with anything you need. No management company we pride ourselves on our service and our homes. Very clean home, w/2 master bedrooms 1 w/king -1w/queen-sized feather padded bed & pillows, vaulted wood ceilings & pr. baths. Old fashioned pine board white washed ceilings & walls, w/ pine hardwood floors. Relax in your hot tub or rocking chair & listen to the shoals on the river. Beautiful real river rock fireplace.. So come and make some once of a life time memories!! We have always loved living here. Our kids grew up here and can think of no place we would rather be... We love sharing our place with our renters and over the years some have become good friends. Hope you will to. We have a great access to the river unlike other homes. Great swimming area and we are in a VERY quiet area with lots of wildlif..we love here And we are HERE to help you in anyway we can!! mountain views on property, but not at home itself If a home on the river says it has a mountain view from home prepare for a 5-8 flight hike down to the river!! 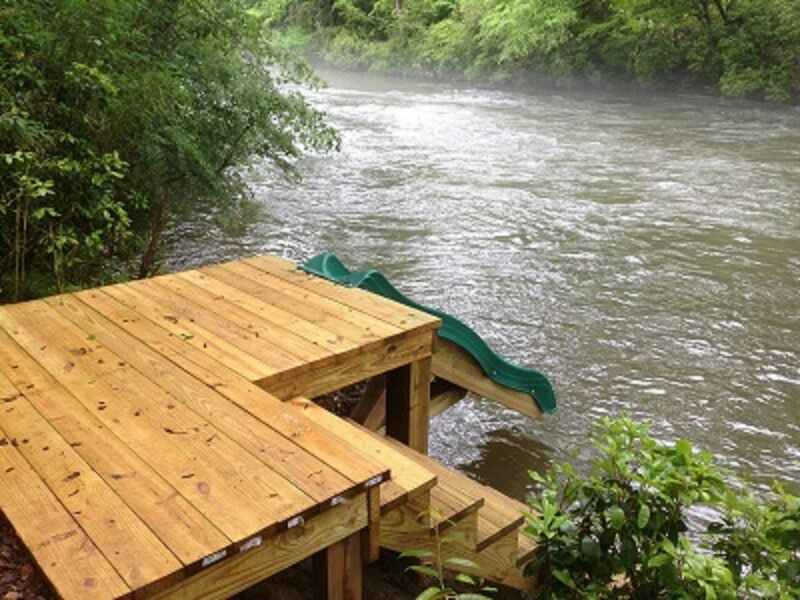 right on the Chattahoochee River, no steeps steps down to the river like homes in our area. There are NO sliding rocks on this river as other rentals may say..but we do know where the real ones are!! sit on the porch and watch and hear the river flow by. River view from porches, Tubes and loungers are available for your use, feather beds, firewood supplies, 1200 feet river frontage (cottage right on river no steep hills to river), tube run, rope swing 2 satellite TVs with Showtime, HBO, Staz, and ESPN channels Kayaking till mid Oct. tubing Mid. May- Mid or late Sept. Cozy, secluded cabin with everything we wanted and needed. Very nice inside and out. Everything was perfect. Awesome location and amenities. Thank you for taking the time to write a review, it is appreciated. I’m so glad you had a good time. We try to make our rentals as stress free as possaible. I try to provide everything so your not running to store for toilet paper etc. We hope to have you stay again with us. Warm cozy cottage on the river. My family enjoyed our stay during the thanksgiving holiday 2018. Cottage had everything needed and just a short drive to the cabin. Thanks so much for making unforgettable memories. We had a wonderful time at Nana's cottage. It was clean, cozy, and had all the amenities you would need. It is a short trip to hiking trails, Helen, and other locations in North Georgia. When we got back to the cottage after a day of hiking, it was nice to get into the hot tub, and then enjoyed a nice dinner sitting near the fireplace and playing board game. A perfect way to spend your birthday with your family. Gorgeous views in a sweet cozy cottage! We took our teenagers for a long weekend to spend time away from real life! Used the kayaks and tubes. Spent some time down on the rope swing! Picked up dvds from Redbox and also watched a few of their movies. Hot tub was so relaxing with an amazing view of the river! Spent an afternoon walking around downtown Helen! Great long weekend away from home! Fell in love the moment we pulled into the drive. Place is completely secluded and private. The house had a farm house feel and is very welcoming. The home had everything we needed. We enjoyed having breakfast each morning on the screened in porch as well as dinner each evening. It was great to sit and hear the sounds coming from the river. The hot tub was just as amazing and relaxing. My husband had a great time fishing, too! I enjoyed just sitting in it and looking through out at the river. We were sad to leave :-( and I am sure if given the chance we will be back! So glad you had a relaxing time. It’s nice that there’s no one else close by and you are at the end of the road. The home was actually built with a plan from an old farmhouse and we wanted people to feel they were at their “Nana’s” home. This is our second time at Nana's Cottage. The first time was magical, when the children young (3-5). I booked again for nostalgia sake. Amazingly, my teen trio loved it just as much. The property is beautiful, well-maintained, and the river provides plenty of activity. Nancy and Robert are readily available. We'll be back! So glad the kids still enjoyed the river and house. It great for all ages. We are getting very well known for the wonderful wines this area produces. Take a wine tour to several in our area.